Our new yoga video is here and it’s really special. I’ve created this practice for all of you that always dreamed to get down in your splits. 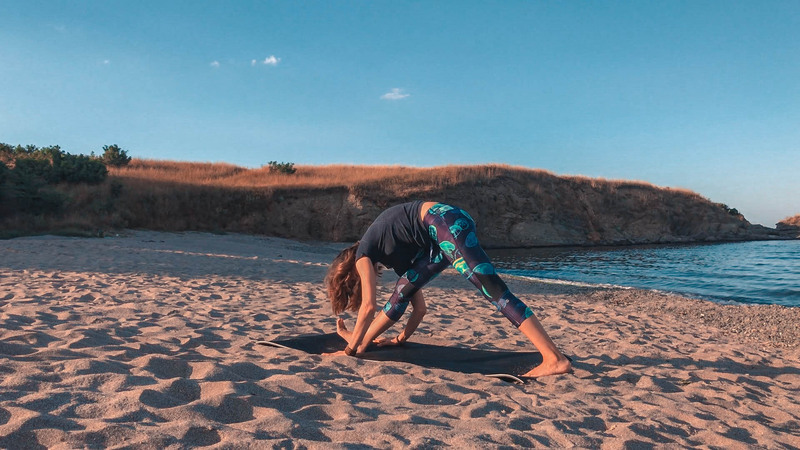 This yoga practice is perfect for you if you always wanted to achieve the splits – front splits and middle splits or if you’re simply looking to gain more flexibility in your legs and open up the hips. In this particular yoga flow are included different postures that will help you loosen the hamstrings, loosen tight hips and let go of any tension within your lower body too. It’s going to target every muscle you need in order to achieve the full leg flexibility. Having flexibility in your legs will not only lead you to your splits, but it will also make your yoga practice and workouts much easier and you’ll see so many positive benefits of this in your daily activities too. This yoga sequence is also great to be done after a lower body workout because it will stretch and release all of the muscles, which will help them to recover faster. Always remember first strengthen, and then lengthen. Stretch, become more flexible and master the splits. Of course getting results will not be immediately so don’t set those expectations for yourself. You will need a constant work and dedication to get your splits. If you stick to this practice and do it regularly 3-4 times a week I promise you’ll get your splits and you’ll be very nicely surprised. With each day your muscles will get used to the postures and will release so you’ll be down in your splits soon. The pose being Parsvottanasana also known as Intense Side Stretch Pose. An essential task for moving into the Splits is to warm up and stretch the hamstrings. Parsvottanasana will open your hamstrings while you practice keeping your hips square. • Start in Tadasana (Mountain Pose), inhale to step your right foot back and turn it out 45 degrees. Keep both legs straight. • Exhale to settle your feet into the earth. Inhale to spread your toes to help activate your legs. Maintaining firm legs, exhale to move the tops of your thighs back and widen your sitting bones apart. • Square your hips by moving your left hip back and your right hip forward. Exhale and make your legs longer by rooting down through your bones. • Inhale to lift your chest; on an exhalation, elongate your spine forward as you fold from your hips. Place your hands on the floor to either side of your left leg. If you’d like to go deeper into the pose, bend your elbows—just be sure to hinge at your hips rather than your spine (you can assess your posture with a mirror or a friend). If you are able to maintain length in your spine, rest your forehead on your shin. • Hold for several deep breaths, maintaining the extension in your spine. • To release, exhale to step your right foot forward into Uttanasana (Standing Forward Bend). Inhale as you come up to Tadasana. Repeat on the other side. If you find your back heel lifting as you bend into this pose, practice with your back heel pressed to a wall. The heel’s contact with the wall will help you keep it grounded. Another way to work with a lifting heel is to raise it on a sandbag. Make sure you don’t rush it, take your time, listen to your body and always respect it. So don’t push too much, too fast. Try to attain a position where you are able to hold the posture without too much pain. Speaking of pain, never push through any sharp, electric, or shooting pain. That is what we call the “bad pain” as it is usually your body letting you know that you are going too far for what it can handle and this can potentially cause injury. It’s great to set goals to work towards but you always have to understand that you are perfect exactly where you are right now. This is your own journey and as long as you stay committed to it, you will always continue moving in the right direction. Listen to your body, take your time and breathe. Be patient, stay dedicated to daily practice and you will get the results you are looking for.